Valentine's Day, Hike at Shivapuri and the InkSpots! Having been single for as long as I can remember and having a short lived relationship that left me embittered and shattered (for a while though), I could not care less about The Valentine's Day but thanks to the delicacy of the feelings that we tend to attach with this thing called "Love" , I was apprehensive to the arrival of this year's valentine day. I was wondering what shall I do this day so as not to feel bad for not having someone to love. Frankly, I don't give a damn about my relationship status. I find it unnatural for me to be in a relationship. An introvert, reserved personality with a critical attitude towards frivolousness and what more, a not so good looking face...not a wonder , I find valentine's day alone. Well, this Feb 14 , along with some tough friends with mine, I planned to celebrate by embarking on an Xtreme hike at Shivapuri National Park. I call it Xtreme owing to the fact that we rarely traveled through the hiking trails, instead we took the difficult shortcuts that's straight through the jungle and up the waterfalls. It was a tiring experience but I enjoyed it immemsely coz I love hiking and I love testing myself to the extreme. As a saying goes "How can you know about yourself fully if you haven't pushed yourself to the limit? " And these experiences are my effort to push myself to the limit and know who I am. A tiresome uphill hike to the Baghdwar and after a short rest again an uphill hike to the top of the hill...I can't describe the pain and the joy as well. 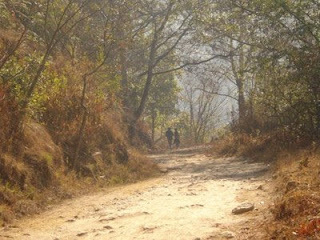 Shivapuri is really one of the most wonderful place for hike lovers and for lovers as well. Panting fast and loud, while I was applying my greatest effort to take one more step uphill and trying to convince myself that the destination was about to come .just a couple of steps more, a thought struck me... "What could Love mean to me?" Would my ev'ry prayer begin and end with just your name? Namaste! Welcome to my blog.